The Southern Vegetarian Chronicles: Could be a Moon Pie? Could be a Moon Pie? Sweet and Sara Smores are filled with vegan marshmallow on top of a graham cookie covered in chocolate. Now all they need to do to make it moon "piesque" is to add another graham cookie on top and then cover in chocolate. It's a different taste and not waxy. The chocolate is top quality (rich and dark, yum!) and the "marshmallow" is a little spongy and sweet to me; the chocolate was enough decadence in itself. Though not the gooey stretchiness that folks are used to with regular marshmallow it is a decent substitute for those missing certain treats from their non-veg days. So, folks, if you are from the south and want to reminisce about a time when you would drink milk and eat moon pies, this little treat will help keep you on your meat free path. By the way, one thing I always hear from people who are southern transplants when I tell them that I am a vegetarian is " I used to be a vegetarian, then I moved to the south" or "how can you be a vegetarian from the south?" Well with items like the one above and the variety of meat substitutes out there, anyone can transition to becoming vegetarian or vegan. 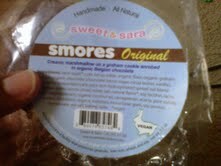 So sit back, grab some soy, almond, or rice milk and grab a Sweet and Sara Smores. You can always mark out the "Smores" and write in Moon Pie. P.S. Now, if they could come up with a banana flavored coating, hmmmm. Check out Sweet and Sara's other yummy treats! Just click here.